Bitcoin is one of the most interesting digital currencies that is available on the market, and with a current increase in popularity of this thrilling cryptocurrency, there are a number of people who are interested in determining where the Bitcoin actually came from. The journey and evolution of the Bitcoin is as interesting as the currency itself, and with it still being in its infancy having only first been thought of back in 2007, we are certain to see a huge number of developments due to be implemented in recent times. 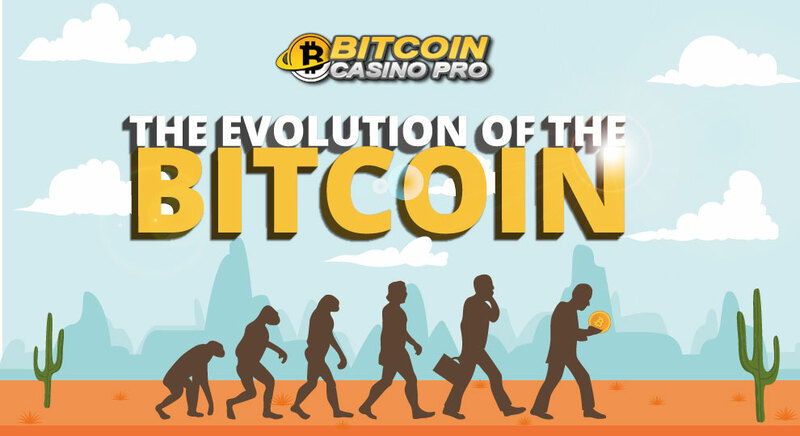 From Bitcoin being introduced in stores, to the revolutionary Bitcoin casinos that we are so fond of here at Bitcoin Casino Pro, we’re taking a deeper look into the evolution of the Bitcoin. The concept of the Bitcoin begun back in 2007, with the pseudonymous Satoshi Nakamoto began working on the idea in Tokyo, Japan. Not only did Satoshi design the Bitcoin and its implementation, he also helped to devise the first blockchain database, which has led to a huge number of security advantages being implemented across the world as we speak. There is a lot of mystery surrounding Satoshi Nakamoto, but there is no denying that his creation is somewhat genius. After the initial design of the Bitcoin concept, one of the first sites Bitcoin.org was registered, a whole year later! But that wasn’t all. In 2008, singer Lily Allen reportedly turned down an online concert after being offered payment in Bitcoin, because of the small value that was attached to it at the time. Now, the value of the fee would’ve been around £118m worth of Bitcoin which is over 20 times her current fortune of £6 million! Safe to say it’s a sore subject with the pop star. 2009 was a very interesting year for the Bitcoin, with more technological developments being implemented and integrated with the digital currency. The first ever block, known as the Genesis Block or Block 0, was mined on January 3rd, which was a huge achievement for the infant blockchain technology. Now, reports are suggesting that 80% of all Bitcoins will be mined by next year – less than 10 years since the first ever Bitcoin was mined! In addition to this, on January 12th, the first ever Bitcoin transaction took place, setting the precedent for the Bitcoin digital currency that we know today. 2009 was also the year of the first ever exchange rate being introduced for the digital currency, and at the time $1 USD = 1,309.03 BTC. Times have now changed with a total reverse of the value of the currency, with $1 USD being equivalent to just 0.00044 BTC as of 30th May 2017. But all was not well for a particular Bitcoin owner in 2009. A British man named James Howells jumped straight onto the Bitcoin tidal wave, and mined a total of 7,500 Bitcoins, preceding to store them in a hard drive due to the fact they weren’t worth very much at the time. The hard drive was then ultimately forgotten about, and this led to Howells ending up throwing the hard drive away, completely forgetting about the Bitcoins stored on it! At the time of being thrown away, the Bitcoins were worth over $600,000, which would hurt enough thinking about throwing that much money away. Now however, the quantity of Bitcoins would equate to a whopping $8 million+, which has been lost to a land fill facility. 2010 saw the Bitcoin begin to evolve even further, with its value increasing ten times over throughout the year. In addition to this, the first real world transaction using the digital currency was made, with 10,000 Bitcoins buying 2 pizzas. This can now be deemed as the world’s most expensive pizzas, as 10,000 Bitcoins would now be worth more than $20 million! The infamous Mt. Gox was also established in 2010 as a Bitcoin currency exchange market, and the market cap even exceeded $1 million USD! With other technological advances like the first mobile Bitcoin transaction being made, it was easy to see the growth in popularity of the Bitcoin. However, the Financial Action Task Force ended up issuing a warning about the use of the digital currency being used to finance terrorist groups and activities, showing how there were a number of concerns about this particular digital currency. This year was a huge one for the Bitcoin world, but not everything was positive about 2011. Firstly, Silk Road opened for businesses, which ended up becoming an online black market which capitalised on the anonymity of the Bitcoin. In addition to this, the Bitcoin Market became concerned about fraudulency, and ultimately the entire market dropped the use of PayPal. Nevertheless, the Bitcoin saw a huge amount of growth, with 25% of the total number of Bitcoins being generated, and the Bitcoin even reaching parity with the US dollar, and also with the Euro later in the year. However towards the middle of the year, the Bitcoin market experienced what is known as The Great Bubble of 2011 – which is the largest percentage price decrease to date. The day after this happened, the largest ever Bitcoin theft was reported, and Mt. Gox also suffered a serious security breach leading to the Bitcoin’s nominal price dropping to just one cent! It was a very volatile year for the Bitcoin, but the digital currency ended up coming out on top. Some of the biggest and best events in the Bitcoin calendar happened in 2012, with Coinbase being founded and the Bitcoin Foundation being formed, who oversee the digital currency and have a core development team that help to streamline the Bitcoin process. 2012 was the first time the Bitcoin market saw Halving Day occur, with Block 210,000 being the first ever block to provide a block reward. The Youngest Bitcoin Profiteer also made his name in 2012. Eric Finnman received $1000 as a gift for his 14th birthday and ultimately invested in Bitcoin after hearing about it on the internet. A year and a half later, Finnman sold the Bitcoins for a huge $100,000, and used the cash to begin Botangle.com! Despite experiencing a significant halt in transactions due to a major glitch in the Bitcoin system, Bitcoin grew from strength to strength throughout 2013. The Mt. Gox exchange rate hit an all-time high of 1 BTC to $266, the first ever Bitcoin ATM was unveiled in California, and the market cap even reached $1 billion! 2013 was a hugely important year for Bitcoin, because a Texan judge ruled Bitcoin as being a currency, which was the first time the digital currency was accepted as a method of transaction. In addition to this, some of the negative sides to Bitcoin such as Silk Road were actually shut down by the FBI, and while restrictions in China became apparent, this could have had an impact on the currency reaching a new all-time high that year with $269 USD per Bitcoin. A number of events happened throughout 2014 and 2015, and one of the biggest and most interesting things from our point of view was the launch of Bitcasino.io, which was the first ever licensed and biggest Bitcasino found online. In addition to this, some global companies like Microsoft began to accept the Bitcoin as a form of currency. In addition to this, in 2015, Barclays also announced that they would begin accepting Bitcoin having partnered with a mobile payment start-up known as Circle Internet Financial. A spokesman for the bank even said that the company supports the “exploration of positive uses of blockchain that can benefit consumers and society.” This was a huge step for the Bitcoin being accepted across the world as a form of currency, and was a positive mood in general for the Bitcoin world. 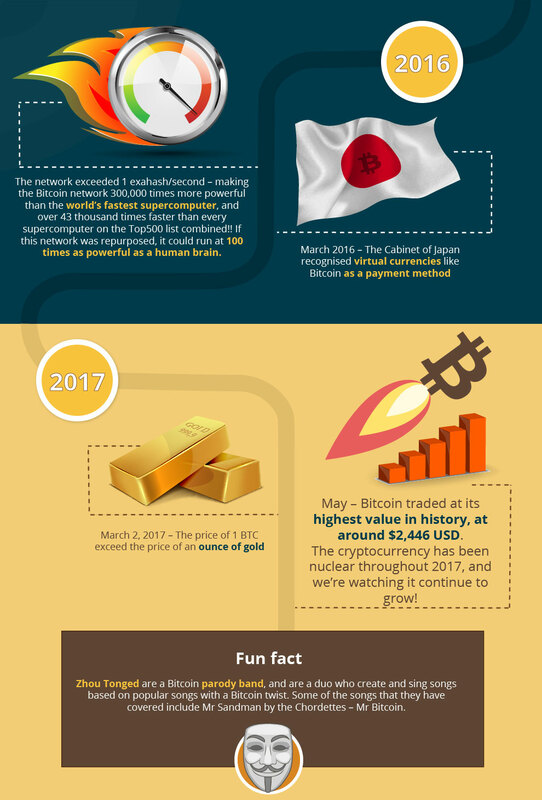 2016 saw the legalisation and official recognition of the Bitcoin in Japan and this is said to have been one of the major factors that saw the Bitcoin rise over $1 billion in 2017. With the network exceeding 1exahash/second, which is more powerful than the world’s fastest supercomputer, it is easy to see how this exciting digital currency is growing and growing as the years pass. 2017 has seen the Bitcoin boom bigger than it has ever boomed before, and this extensive increase really is the perfect opportunity that the digital currency needs to be fully accepted around the world. In May 2017, Bitcoin traded at its highest value in history, averaging at around $2,446 USD! This is a huge increase for the Bitcoin, and while there have been occasional drop offs here and there throughout the month, the currency’s value has continued to rise.